I've attended Glastonbury since 1995. In 2000 I found myself struggling in general camping areas while using a stick, so since 2002, I've been using the disabled facilities. 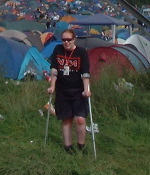 I've experienced Glasto both on crutches and in a wheelchair throughout the event. This article is based on the facilities available in 2007, but with updates where new facilities are anticipated in 2008. Here's the 2007 Access Map, it doesn't show the new viewing platform at Acoustic stage but it's quite detailed. You need to apply in advance for use of the disabled facilities and provide evidence of your disability, to disabledenquiries@glastonburyfestivals.co.uk and in 2007 for the first time you could get a free carer ticket if you were on middle or higher rate DLA - the deadlines will be 16 May 2008 to apply for a carer ticket and last year the deadline was 31 May to apply for any other facilities such as campsite and viewing platform. So apply in good time! There's more info on the Official Website and as in 2007, the access co-ordinator this year is the wonderful Claire! Her contact details are in the linked page. If you're interested in the 10 page document of suggestions which I sent to the Festival in 2007, click here (PDF). I'd love to hear what other people think of the facilities so we can get improvements year on year. There is a blue badge carpark, which will be signed, and then you can ask the stewards to direct you to it as you near the site. It is at Yellow Gate - just before Red Gate and the bus station, as you approach from Glastonbury town. If you have a temporary disability or don't have a blue badge, you may still be allowed to park - or at least drop off - this depends on the kindness of the stewards. In previous years I've been able to be dropped off there (when I didn't have a blue badge, because we didn't have a car). In that case, it helps if you can carry some kind of "disabled person" symbol (such as buying a wheelchair sticker from Halfords) so your car will not be redirected into general parking by mistake along the route. Display your badge clearly in the windscreen as you approach the site, well before the gates. If you suspect you are in the wrong place, look for a marquee which comprises the mobility minibus pick up point and check which stickers the surrounding cars have on their windscreens - sometimes we entered the correct gate but were then misdirected into staff parking areas. In the blue badge carpark is a pick up point from which a mobility bus will collect you and take you, your companion and your luggage straight into the site. It can take a while to arrive so if you've just missed it, sit down and chill out. We make sure to arrive with a beer or two and a newspaper! The round trip for it to set off, drop off and return takes over an hour. The bus does take you straight to the disabled camping area, although I've seen other people who weren't camping there (but couldn't walk far) use it as well and get dropped off inside the site. Because of the gate checks you will need your tickets with you (from 2004 onward we have been driven to the pedestrian gate where they boarded to check ID and issue wristbands, before going on to the disabled campsite) so don't put your tickets in your rucksack (which will be buried in a pile of luggage at the back of the bus), keep them handy in a pocket at all times! Also note that even once the bus has arrived, it can be an hour until you arrive at the campsite if the ticket checks are slow - so it's best to go to the loo before you arrive! I usually go to Sainsbury's in Street on the way. Even if there is a loo in the Festival carpark it may not be accessible, lockable, or have any loo roll - so be prepared! If you are unable to use the mobility bus or have particular equipment etc. that you need to get on site, you can apply for a short stay pass so you can drive to the campsite, unload, and then drive back and park. The same applies in reverse when leaving. However these passes are limited so you should only apply if you really need one. Until 2007, the campsite was located between the Cinema and Dance areas, a short distance from the Pyramid and Other stages. In 2007 it moved to Spring Ground, which is to the east of the Cinema field. The space filled up quickly but there was more room for aisles and for the campfire, and was fairly quiet at night as it is away from the stages. 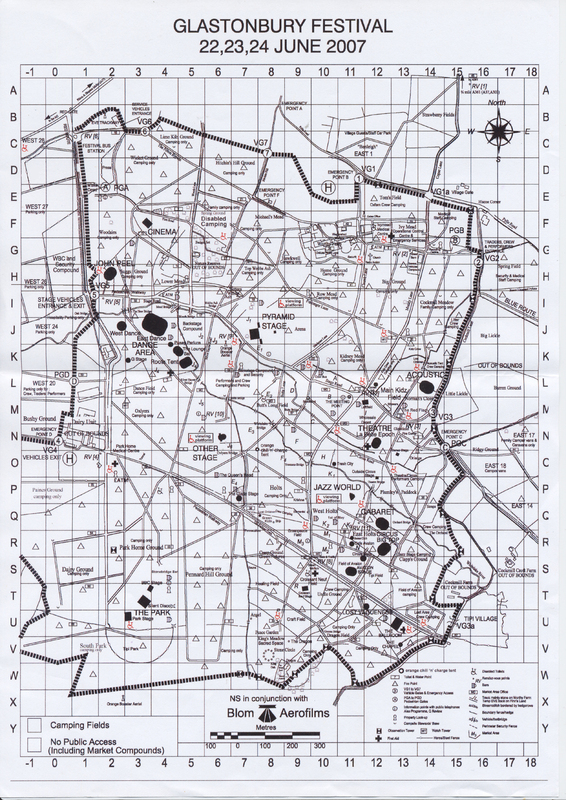 You can see a map of the site here: detailed 2007 access map. The campsite is a fairly friendly place run by the lovely John, who will introduce himself to you and sort out any problems you might have. It can fill up fairly quickly and obviously it's a limited size. By Wednesday evening it is usually well over half full already. Since 2005 the campsite has been stewarded by staff from Attitude is Everything, and there have been strict rules about the size of tent permitted (up to 4 man only). To use the campsite you must apply in advance and provide evidence of disability, and will be checked against a list on arrival. So don't assume you will be able to get in - be sure to check and to register! Generally, only those with permanent disabilities are admitted (although those with temporary issues like broken legs are often able to get wristbands for use of the viewing platform and accessible toilets). There is a reasonably free choice about where to pitch your tent, but the space nearest to the recharging and washing facilities is kept for those with the least mobility, and everyone is expected to keep their tents as close as possible to each other, to make best use of space. At the campsite are disabled loos - important, because the normal loos are too small to keep your leg straight, or to turn around with crutches, and of course these accessible loos are the only ones which can take a wheelchair. Even then, they can be a tight fit for large powerchairs. They are large tardis style portaloos and have no lighting, so at night you might appreciate taking a torch on a string to hang around your neck so you can see what you're doing! There are also disabled loos elsewhere but they are few and far between, and sometimes used by the public or backstage crew (depending on location) so those in the campsite are the cleanest. Also at the campsite is a basic shower - a large "tardis" shower cubicle, and despite the best efforts of engineers the water always seems to run cold! I leave the shower for people who need it, and wait until I get home to wash, like nearly every other festival goer! There are wheelchair charging facilities for those who need them, and Woods Lane secure lockup is near to the campsite. Programmes are issued to festival-goers on the gate, so be sure to find out how to get yours! Sometimes they are issued on the bus, and at other times they are provided from the campsite. Do find out how to get one if they aren't offered (particularly relevant if you arrive early) as copies cost £10! In the past, the vibe in the campsite has been a bit flat, but in 2007 we moved to a new field and everything was rearranged with flags and helpful stewards who were more in the centre of things. The stalwart campsite manager John sorts out any issues and our amazing access co-ordinator Claire drops into the site every day as well. Now, although it's still a quiet place to rest, the campsite is cheerful and there's someone to talk to. You can also make a hot drink or charge your phone if the power points are not in use for wheelchair recharge, but do bring your own cups and teabags, and buy some milk on site, so there's enough for everyone! You cannot have a campfire by your tent but there is a large communal one to which all are welcome - but beware if you are camped nearby, over-exhuberant folk around the campfire can disturb your sleep! Things are a little better now there is a fairly free choice as to where you may pitch your tent - in past years we have ended up next to a large noisy family, with kids that kept bouncing a football into our tent, and parents that were arguing all the time, but in 2007 we lucked out and ended up near other, quiet, people. I wish there were separate "family" and "quiet" areas within the campsite, but unfortunately this is not the case. On the plus side, you are allowed to invite friends to join you during the day, which brightens things up a lot because I need to spend a lot of time resting back at camp. As you can appreciate, the Festival is set on a farm, which involves dirt tracks and slopes, and so mobility can be difficult. If you are ambulant, there is a lot of walking! The site is 900 acres in size and it takes an able-bodied person over an hour to get from one end to the other. So there is a lot of time spent either traipsing around or resting! Be ready to take a long time on excursions to see a band or to get food; even trips to the loo can need logistical planning! In 2008 we are told there will be an accessible shuttle bus from the campsite to the Park, Theatre and Circus areas, which should be a great help! Ideally one needs someone very kind (like my partner) to accompany you, carry your stuff, get you settled, and then to scoot off and get food and drink for you both! But even so, do practise carrying and unfolding/folding a chair on your own while wielding crutches, so if your friend has gone off to see something/get food/use the loo and a rainstorm kicks off (or if you are in the way of an emergency vehicle or something else unexpected), you can move relatively quickly. When using crutches, I carry an aluminium fold up directors-style camp chair (£5-£10 from Argos or similar), slung over my neck with an arm through it like a sachel, and a small rucksack with spare jumper/poncho in it. It's not too hard to do but it does need a bit of practise if you're not used to it! Also I find it's harder to walk on stiff, dry grass, than on slippery wet grass (which at least bends as you move through it). It is a lot more tiring than "normal" walking on crutches. The metal roadways, where they exist, can get very bouncy with everyone walking on them (a bit like the Millennium Bridge!) and you do have to move off whenever a vehicle comes, so I avoid them if I can. It can be very hard to self-propel, partly because the tracks are rocky and have quite a camber, and so even an experienced chair user will probably get more tired than they expect. When it is muddy, you may find a manual chair to be useless - in 2005 one chap was stuck in the campsite until Sunday when the ground had dried out. For that reason, a lot of people bring electric chairs, or a trike attachment for their manual chair so that they can go across difficult terrain. If it's wet be careful; a film of mud covering the paths will mean you cannot spot potholes, and this caused me to break my chair in 2007. It's safest to stick to the metal trackways and to go very slowly on other paths. If you can use crutches, bring them as a backup as they will be helpful when going to get food or use the loos around the campsite area. There is no scooter hire at Glastonbury, but there is a local company, PLUSS (formerly Somerset County Enterprises) which will deliver equipment to the site by prior arrangement, be it a scooter or even a hoist. You will need to hire it for a week, having it delivered on Tuesday before the Festival and collected on the Tuesday afterwards, and pay hire and delivery charges. If you know anyone else who is hiring equipment, you may be able to pool delivery charges. Scooters do work at Glastonbury if it's not muddy, or if you stick to the paths when it's wet. However, I find I notice every little bump and wobble in them, in a way that you don't experience when shopping! So be prepared for a bumpy journey. If you have a condition which is worsened by jolts, you may not enjoy using a scooter at Glastonbury at all. At the end of the night, there are usually large crowds in a few places - mainly exiting the two main stages. It can be quite unpleasant as you are swept along at the pace of the crowd, and people will be drunk and might push into you or fall over you. It's also hard to watch your footing, as despite overhead lighting, it's quite dark in the middle of a crowd. So avoid busy areas and if you see a crowd wait for it to pass, it is horrid to be stuck in them. Also, please see my comments under "Useful tips" about how to make yourself visible at night. Much better to be seen than to be hurt by people falling on you! 2004 yielded my first experience of a muddy festival. The main problem was its stickiness - several inches of goo. It was also slippery in places. This meant getting about took longer and was more effort, not just for me but for my assistant who found it harder to help me and at times both of our tempers became a little frayed! However, staff were very helpful and allowed disabled people through the backstage areas which made a great difference, particularly the path behind the pyramid, which is a tarmac road. Allow loads of time for stops to rest, relax into the whole thing, and you should be fine. The main viewing area is towards the back of the Pyramid (Main Stage) arena. It takes a while to get to, and it can be very cold when the wind / rain / fog sweeps across, so take a spare jumper in the evening even if you don't think you'll need one. I was freezing while watching Roger Waters in 2002, and I was wearing a nice thick hooded jumper. In 2004 I sent my partner off to find me a warm hat! Also, the view is ok but you are miles back (this photo shows you the kind of view there is from the platform) and you might find a better spot elsewhere. It was moved to be slightly closer in 2004 but it's still some way from the action. The main issue for me is that everyone in the arena stands up when the headline acts come on stage, and I can't stand for very long, so I use the platform for bands I really want to see. However, the platform fills up fast for popular acts, and the atmosphere can be a bit niggly if people are jostling to see, so it can be more pleasant to sit at the back of the arena instead. Another problem is that the metal trackway stops some way from the viewing platform, so in a muddy year you may have to traverse several metres of sticky, foot-deep mud. People will often be kind and help you across, but it can still be frightening being unable to move, in a crowd, with strangers pulling at you. I hope in future years the trackway will continue right up to the viewing platform. Smaller viewing platforms are found at the Other Stage, Jazz World and the Acoustic Stage. In past years there were issues with stewarding during the day, but in 2007 it was all taken much more seriously. The only issue is that the viewing platform area is locked when it is not stewarded and there is no music on, denying access to the accessible toilets! We are told that in 2008 there will also be a platform at John Peel Stage. You can usually only take one person onto the viewing platform with you - although there is usually room in front of it for people to stand, but don't expect a group of friends or family to be on it with you unless it's half empty! And at busy times, don't take your assistant on at all, unless you want to incur the wrath of others who can't get on! The dreaded Glastonbury loos are not as bad as you might have heard, but it's hard to find an accessible one. Prior to 2003 I hadn't found one at all and had to return to the campsite every time I had the need! In 2004 I found a few more and in 2005 I had it sorted! The best loo was backstage at Jazz World, because there is a great vibe (and it's near the backstage bar!) but it is used by lots of (able-bodied) people so you need to take extra time and supplies to clean it before use. In 2007 this toilet had been moved to the Jazz World viewing platform, which was annoying as I couldn't use it on Wednesday and Thursday, when the platform was closed off! The worst loo was publicly accessible near the Leftfield, next to the regular cattle-pen toilets. Suffice to say it was full and could only be used by a contortionist - it was absolutely disgusting and unusable. However there's one by the Acoustic Stage viewing platform which you should be able to use. Apart from by viewing platforms, the other loo I found was near the Other Stage arena, in the medical centre compound. However to reach t his from the platform you had to go up a steep slope onto the railway track and back down - I could only just manage on my crutches. A wheelchair user would have to go to the other end of the field, up a gentler slope, and back through the field on the other side of the railway track. Nearby campsite staff had no idea it was there, and nor did the medical staff! I had to find it myself by trial and error, and then point it out to the medics before I was allowed in the enclosure. Staff had camped next to the loo, so there wasn't sufficient clearance for a wheelchair and I nearly fell over the guy ropes. However it was very clean - just as well, because there was no accessible sink nearby. In fact, the accessible toilets are generally nowhere near a sink, but they do contain antibacterial gel for a handwash. This gel will kill bugs, but it won't get your hands clean if they are muddy, so you may want to carry some wet wipes around with you as well as loo roll or tissues. Don't forget to take a torch around your neck so you can see - many toilets are unlit at night, and it's hard to juggle torch and crutches or wheelchair! Ideally, I'd like to see a disabled loo by every group of regular toilets, and another by each viewing platform, but locked with a RADAR key to keep out those who don't need it and will just leave it filthy. Perhaps spare RADAR keys could be available to buy or hire at the campsite and info points. Just an idea! In 2007 there were accessible toilets in 17 locations. There are various facilities on site which you can use. In particular there are two Medical centres and the pharmacy. A Medical centre is useful if you need to change dressings or equipment in a clean area, and can store any medicines which need to be refrigerated. Unfortunately they are both quite a way from the disabled camping area. There are no medical facilities at the campsite, just a marquee with power points for charging wheelchairs etc. However if you need a fridge, it's worth checking whether there will be one at the campsite that you can use. If you have more specific needs, such as requiring power overnight to run equipment, I would recommend you speak to the medical team to see if it can be accommodated. However, the solution may be to bring a campervan (these are allowed in the disabled camping area by prior arrangement although you'd need to provide your own power) or to stay nearby. Of course, local accommodation sells out months in advance, so you would need to plan well ahead. As well as local farms and B&Bs, there is a Travelodge in Glastonbury town. Here's a handy guide to places to stay in Glastonbury. Very important - make sure people can see you. Get loads of reflective tape (e.g. from Halfords) and plaster it all over your sticks or chair. People will fall over you so don't be afraid to warn people who look a bit merry with a loud "mind my chair / sticks, please!" - this is particularly relevant in the mass movement from the arena area at the end of the night - you might have to wait an hour for it to clear. It helps to put the tape on the back and legs of any chair you use too, as people in crowds seem to assume that everyone is standing up or can move if they barge past, and that everyone is moving at their speed. In the past I bought funky reflective stickers from Cyberglow and they have many other reflective products. If you don't fancy tape all over your chair or sticks, less permanent ideas include buying loads of glowsticks (cheap online from The Glow Company) and using masking tape to attach fresh ones every evening. This works phenomenally well with crutches - a few quid for 100 glowing "bracelets" on eBay is enough for several Festivals. Suddenly I went from not being seen, and people pushing into me, to being very visible at night and attracting several comments about "cool sticks"! In fact I would tape them on (unsnapped) by day, by putting tape around the connectors which are supplied to join them together, then when night fell I would pull the sticks out of the connectors, snap them until they glowed, and tuck them back in place. It worked very well! Alternatively you can buy cheap cycle lights from Tesco and clip or tape them on front and back if you are in a wheelchair. Make sure all your equipment is working well ahead of time. If you've hired a chair for the festival, make sure it steers well and you are practised in using it - test it on some rough terrain if you can, so the site doesn't come as a shock! Equipment like power trike add ons can work well on pavements, but quickly get tired on the rough and hilly ground of the festival. Don't forget to bring the charger! If you use crutches, check the ferrules (rubber bits on the bottom) and if they have little tread, get some new ones - a few quid from mobility supply shops, and can be bought online. Get some insulating foam pipe from a DIY store and masking tape it onto the handles so you don't get sore hands. If you use a wheelchair, check the condition of the tyres before you go, take a puncture kit if your tyres are pneumatic, and ideally take a small toolkit too, in case anything gets knocked out of whack and needs tightening or adjusting while you are there. If you get stuck, John the campsite manager can usually source whatever you need, but it's best to be prepared! Carry sun cream because every time you go to the loo and wash your hands it will come off. At the end of Glasto the backs of my hands - always on display to the sun, because they are holding my crutches or pushing my chair - are rather burnt! Alternatively, invest in a pair of cycle gloves or similar. Millets have fingerless gloves with padded palms which are ideal and only cost about £5. For more info on past Festivals, including coverage of other disabilities such as visual impairment, there is a diary from a disabled person at Glastonbury 2002 on the BBC's Ouch! website. However, things change and improve year on year so do check with the access co-ordinator if you have any specific needs which I have not covered.